Monitor the health of your structure in real time to ensure its safety. Trust Civionic Engineering and Consulting when you need reliable structural seismic sensors for your bridge, tower, or other structure. Civionic Engineering and Consulting offers considerable expertise to companies like yours. Our team of experienced professionals works with construction and engineering firms, operators, and owners to provide custom sensor solutions that ensure a project’s longevity. With our help, our clients can keep track of their projects’ health and make each project safe and successful in the long run. If you choose Civionic Engineering and Consulting, you can rely on our track record of success, our team’s deep knowledge of our field, and our commitment to our clients. We always keep working until our clients are satisfied that our solutions are exactly right for their projects. Our sensor solutions are comprehensive, allowing us to tailor a plan to each client’s unique circumstances. One of our quality tools is our range of seismic acceleration sensors. Learn more about these tools below, including their capabilities and product specifications. If you have questions about our structural seismic sensors or about our services, please reach out. Call us at +1 (604) 655 4200 to speak with a member of our team. We look forward to working with you. Our new range of seismic acceleration sensors can be mounted virtually anywhere. 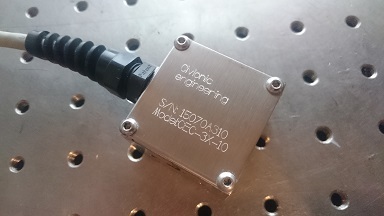 With its small footprint of 40x40mm (1.57″ x 1.57″) and a height of 20mm (13/16″), we can measure vibrations from 0 Hz (DC) to 100Hz. Our sensors are available in ranges from +/- 1g to +/- 200g.